I just love this layout, don’t you? Tangled Briars is a nice block to start. A few half square triangles, a couple of squares, and you’re done. If you have a favorite HST method, you’ll need to make 16 half square triangles that finish at 2 inches, and 4 half square triangles that finish at 4 inches. If you don’t have a favorite HST method, check out the Skill Builder posts for several options, or try the methods below. Although I will provide complete instructions for each of the blocks, I strongly recommend you check out the Skill Builder posts, not only for HSTs but for fabric preparation and quarter inch seams as well. I won’t go into the extreme detail here that we did in those posts, and there’s a lot of useful stuff there. Also, you’ll notice that I prefer to cut my pieces slightly larger than truly needed and trim the components to size before assembling the block. Some of the women I sew with prefer to cut them even larger than I do, so in the PDF of this block you’ll see alternate cutting sizes. If your blocks tend to turn out smaller than they should, you might give those sizes a try. From the background fabric, cut (2) 6″ squares, (2) 5″ squares, and (4) 2 1/2″ squares. Cut (2) 5″ squares from the center fabric for the larger HSTs. Cut (2) 6″ squares from the points fabric for the smaller HSTs. To make the larger half square triangle units, draw a diagonal line on the back of the two 5″ background squares, then draw two more lines 1/4″ to either side of the center line. Place the squares right sides together with the 5″ squares of the center fabric and sew just to the inside of the two outer lines. Cut on the center line and press to the background fabric. You will have four HSTs. Trim to 4 1/2″ aligning the 45 degree line on your ruler along the seam line. To make the smaller half square triangle units, you’ll do essentially the same thing you did above, but times four. Draw the diagonal line on the back of the 6″ background squares, plus one on each side, then draw the diagonal lines in the opposite direction. Place the squares right sides together with the 6″ points fabric and sew just inside the four outer lines. 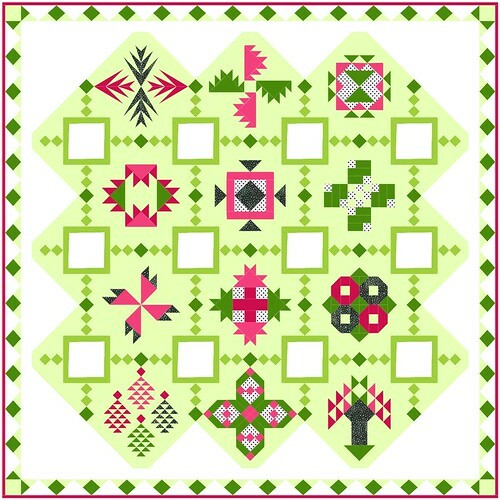 Do NOT cut the diagonals yet – instead, use your ruler to cut the 6″ square into four 3″ squares, in a + shape. Without picking up the fabric, then cut the center diagonals. Press to the points fabric (not the background). Trim to 2 1/2″, aligning the 45 degree line on your ruler along the seam line. Assemble each quarter of the block. Lay out the half square triangles and square. Sew the top two small HSTs together and press to the points fabric. Sew the background square to the left side and press to the square. Sew the other two half square triangles on one side together, pressing toward the points fabric. Sew that unit to the large half square triangle and press to the center fabric. Sew the top and bottom sections together. Repeat for all four quarters, then sew the quarters together, making sure to turn two quarters so they point in and two so they point out. There’s your first block! Any questions? Click here to download a “short version” of these block instructions in PDF form. Please visit the Botanicals BOM Intro post for optional settings with fabric requirements and links to all blocks that have been posted so far. Is this a scrappy quilt? If not is there a fabric requirements page? Wonderful demo ! Thank you!